When a Wigan mum gave birth to her third child on the same day as the Duchess of Cambridge, she had no idea that she was about to beat the Royals to choosing her newborn’s name. 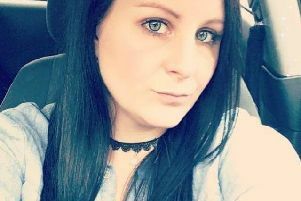 Karen Johnson, 29, was rushed into Wigan Infirmary’s maternity ward at around 12.40am on Monday, April 23. Just over an hour later, at 1.42am, she had given birth to her son Louie Adamson, exactly a month before his due date. The Aspull mum-of-three said that Louie was the “only name” her and partner Scott Adamson had agreed on prior to his birth and that she would not change it now despite it becoming the most high profile name in the country. “Louie was the only name we had both liked when I was pregnant,” said Karen. “I hadn’t told anyone because I think sometimes people will try to put you off. We just kept it to ourselves. “As soon as we saw him we said yes, we are having Louie. All our friends and family absolutely love the name. We don’t even know anyone else called Louie. Her newborn son remains in hospital due to feeding problems brought on by a premature birth, but the new doting parents are spending time with him in the ward until he is well enough to be brought home. Karen, who was due on May 23, said that she began to have stomach pains at around 11pm on the Sunday evening and rushed to hospital, ringing ahead to the maternity ward. Louie is “doing well” and hopes to have brought him home by next week.